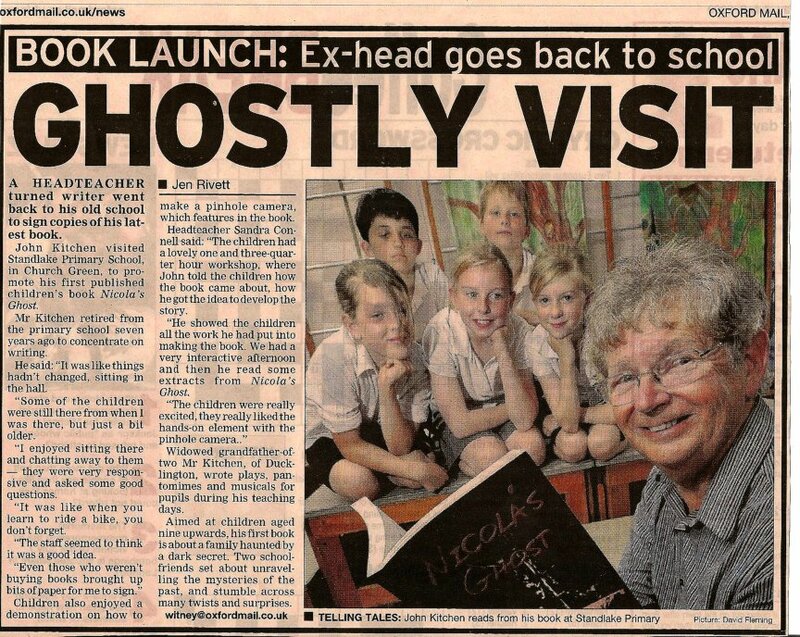 John Kitchen creates a great plotline with Nicola's Ghost, a story with a twist for pre-teens. Issues such as bullying, spitefulness and parenting were of immense interest. Others I could mention, but I would give the plot away. ... Nicola's Ghost is a good book. One I will be giving my daughter to read. Nicola's Ghost is really a book for 8-12 year olds, but is full of the kind of surprises, twists and turns that kept me (a 31 year old woman) guessing to the end. Not a conventional ghost story, the characters are developed in such a way that you are as interested in finding out their fate as you are in unravelling the mystery. The writing style is very readable and the pace fast enough to hold your interest throughout. I would recommend this book to both children and their parents. A brilliant read! 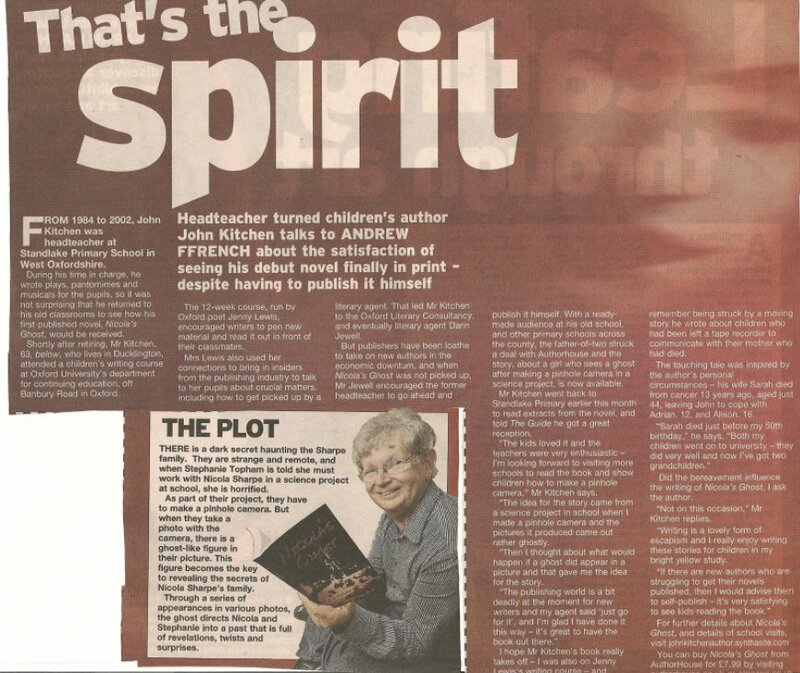 John Kitchen's book takes us on an intriguing journey as Nicola's ghost reveals herself. Set in a modern day home and school environment, the author's experience in teaching and knowledge of how children think and behave are put to good use in this fast paced, exciting drama. It's a book that, once started, is very hard to put down as the mystery of Nicola's ghost unfolds. We hope John Kitchen's next book is just around the corner. This book kept me reading for hours. I had to keep reading the next chapter to find out what happened next. Nicola was my favourite character because she was strange and I wanted to know why. My favourite part was the bit at the end where it all came together. It's a great book because it keeps you guessing and it's full of surprises. I hope he writes more novels like it. Nicola's Ghost is a great book. In fact, one of the best books in the world!!!! Once I had started reading it I couldn't get my head out of it - it's so difficult to put down! It was a pleasure reading it and I would be glad if you wrote another book. 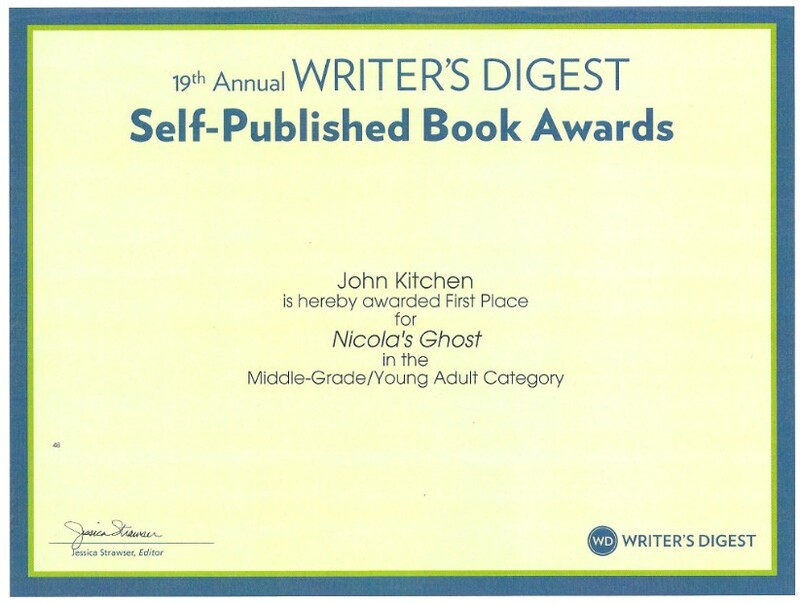 In 2011, John won the Writer's Digest Book Award for Nicola's Ghost. What a great book! I actually could not put this one down. The author did a great job of developing the characters so that they seemed very real... I enjoyed that the author jumped right into the story so that you could not wait to see what happened next... there are lots of twists and turns to develop the story and although it was written for young adults, I loved it and think it is great for all ages. Whilst A Spectre in the Stones has been written primarily for young adults, it's so entertaining it is excellent for all ages. Lloyd Lewis is drawn as a fascinating character - a young man who has spent a lifetime 'in care'. He is angry yet intelligent, and his story is told with strong page-turning pace. One of the things that this book highlights is the strong leaning towards information - if one should say education it might put some young people off - but the amazing facts that are revealed are so fascinating it draws you to find out much more about ley lines and the past archaeology of Wiltshire. The story contains a range of very well drawn characters, both adult and teenage, with each playing a very pivotal role in Lloyd's adventure. It is also quite scary in places, with ghosts and unexplained phenomena, but it's never overplayed for effect - just to move the storyline on. John Kitchen has written this book with great sensitive insight into the strengths and weaknesses of young people with troubled lives and I can't recommend it highly enough. It was just amazing. Loved it. It was so interesting and full of character and I really enjoyed it lots. A Spectre in the Stones explores the relationship of the main character with both his peers and elders. He finds trust difficult, given his unfortunate beginnings. As a former teacher, John Kitchen shows a natural expertise in drawing out the feelings Lloyd Lewis is experiencing. Combine this with an exciting story line involving the supernatural, and a really interesting plot, and you have a superb novel aimed at young teens, which makes 'A Spectre in the Stones' really hard to put down. When Lloyd Lewis moves to a new children's home he does it with trepidation. He's heard rumours of strange happenings at the home and sure enough, the minute he arrives, he's swamped by an uneasy feeling of chaos, suffocation and a universe that's not quite right. This book is aimed at slightly older children than John Kitchen's previous novel and follows Lloyd as he unravels the mystery that surrounds Sarson Hall and finally starts to find a place for himself in the world. Lloyd is a likable and believable character and the story draws you into the dark, supernatural elements, whilst chronicling Lloyd's own personal journey. A riveting read for older children and adults. This is a really good book for boys aged 9-12. The hero at first appearance seems truculent and unattractive - given his background that's hardly surprising - but he has an inner strength and integrity which grows on the reader. A Spectre in the Stones contains some of the very best crafted characters I have ever encountered. The sarcastic, surly Lloyd, who seems bent on his own destruction, is compelled by circumstances to change for the better. Then there is the extremely disturbed Caitlin, as well as Rudi, the ever diplomatic Indian boy; all of them unique, fleshed out and well defined. Set in Britain, this book is so typically British. From the stiff upperlipped libraian and the strict children's home carers, to the modern professor; this is a masterful portrayal of certain types of British people. The story is full of suspense and some realistic, if thoroughly heartbreaking moments. Recommendation from John Vincent for those involved with looked-after-children. Set in a creepy, haunted children's home, this story follows Lloyd Lewis as he unravels the mystery surrounding the building (and its malevolent influence on its inhabitants), whilst at the same time, learning - at last - that there are peers and adults that he can trust. It's a good supernatural read, with some strong underlying messages, well worth trying with early teen readers (and, I think, could also work well as a story read aloud over a period). Time-slip novels can be confusing and difficult to keep track of. However, I read this page turner in a single sitting, finishing at one in the morning. John Kitchen chooses his home county of Cornwall as a setting for this fast moving tale of intrigue and high suspense, moving dramatically from 17th to the 21st century. We follow the lives of the hapless servant girl Martha Jax and her modern counterpart, Jack O'Hagan. Martha's voice resonates through time and becomes inextricably linked with teenager Jack O'Hagan, who comes to live in the house where Martha Jax once lived. John Kitchen has captured not only a true Cornish voice but the very essence of Cornwall's rugged coastline and brutal smuggling tradition. A thoroughly good read.